Torquato, F. O. & Muelbert, J. H. Horizontal and vertical distribution of larvae of Engraulis anchoita (Hubbs & Marini 1935) off Albard�o, Southern Brazil. Pan-American Journal of Aquatic Sciences, 9(3): 154-166. Download PDF file (1,113 Kb). Rezende, G. A., Pezzuto, P. R., Dumont, L. F. C. & D'Incao, F. Feeding habits of the deep-sea shrimp Aristaeopsis edwardsiana (Johnson 1867) (DECAPODA: ARISTEIDAE) on the Southeastern and Southern Brazilian coast. Pan-American Journal of Aquatic Sciences, 9(3): 167-178. Download PDF file (709 Kb). Jones, N. A. R. & Magurran, A. E. Aggression in captivity and the implication for interspecific aggression between once sympatric species of Mexican goodeid. Pan-American Journal of Aquatic Sciences, 9(3): 179-187. Download PDF file (596 Kb). Bezerra, D. S., Amaral, S., Kampel, M. & Andrade, P. R. Simulating Sea-Level Rise Impacts on Mangrove Ecosystem adjacent to Anthropic Areas: the case of Maranh�o Island, Brazilian Northeast. Pan-American Journal of Aquatic Sciences, 9(3): 188-198. Download PDF file (577 Kb). Ebert, L. A., Branco, J. O. & Barbieri, E. Daily activities of Larus dominicanus (Lichtenstein 1823) at Saco da Fazenda, Itajai-A�u river estuary, Itajai, SC. 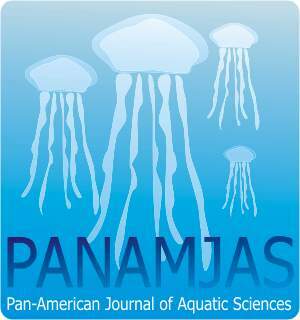 Pan-American Journal of Aquatic Sciences, 9(3): 199-206. Download PDF file (441 Kb). Sassi, C. F. C., Sassi, R., Gorlach-Lira, K. & Lima, R. C. P. Pigmentation patterns of Siderastrea stellata Verrill, 1868 (Cnidaria, Scleractinia) from coastal reefs in Northeastern Brazil and its relation with zooxanthellae and other microsymbionts. Pan-American Journal of Aquatic Sciences, 9(3): 207-222. Download PDF file (1,155 Kb). Sutili, F. J., Gressler, L. T. & Baldisserotto, B. Anthelmintic activity of the phytochemical eugenol against the fish parasite Gyrodactylus sp. and acute toxicity in Daphnia pulex. Pan-American Journal of Aquatic Sciences, 9(3): 223-227. Download PDF file (194 Kb). O'Malley, B. P. & Maitland, B. M. Observations on the freshwater zooplankton of Dominica, West Indies, including records from the former Matthieu landslide-dam Lake. Pan-American Journal of Aquatic Sciences, 9(3): 228-233. Download PDF file (1,013 Kb). Toledo, G. A. C., Gurgel Fo., N. M., Zermiani, F. C., Azevedo, J. C. N. & Feij�, A. Albinism in neotropical otter, Lontra longicaudis (Carnivora: Mustelidae). Pan-American Journal of Aquatic Sciences, 9(3): 234-238. Download PDF file (378 Kb).